In its attempt to gain international legitimacy, Hamas is presenting a conciliatory face to the Western media, while rejecting peace to its own people in Arabic, and even denying that the conciliatory statements were made. "[Hamas] MP Mushir Al-Masri denied what was reported in various places in the media about Hamas abandoning its principles, relying on statements attributed to the Prime Minister designate, Ismail Haniyah, according to which he hopes that a peace treaty will be signed with the Israelis. He said that these statements, released on CBS, are unfounded [lit: naked of all truth]. 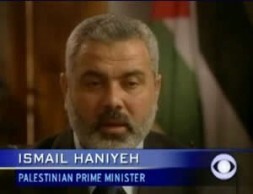 Al-Masri said that these matters are part of a crazy campaign which aims at embarrassing and confusing the Palestinian arena and undermining the trust of the masses in Hamas movement… He added: "the Palestinian media grasps that this campaign should not be related to… and it understands that America endeavors to undermine the [Hamas] movement in the eyes of the Palestinian people…" As to the PM's statements, which have been distorted, Al-Masri said: "the American channel [CBS] broadcast that Sheikh Ismail Haniyah had said in an interview that he hoped that a treaty with Israel would be signed in the White House. I believe that the basis for the controversy over the [Hamas] political plan are the [peace] agreements, which in our opinion bring no benefit…"
It should be noted that the reason for this strong rejection of the willingness for peace with Israel is that it violates the most basic tenet of Hamas' belief, that Islam demands the destruction of Israel. Article 13 of the Hamas charter states: ". . . Renouncing any part of Palestine [i.e. accepting Israel] means renouncing part of the religion." Hamas would have to scrap and recreate the basis of its religious ideology to accept Israel.